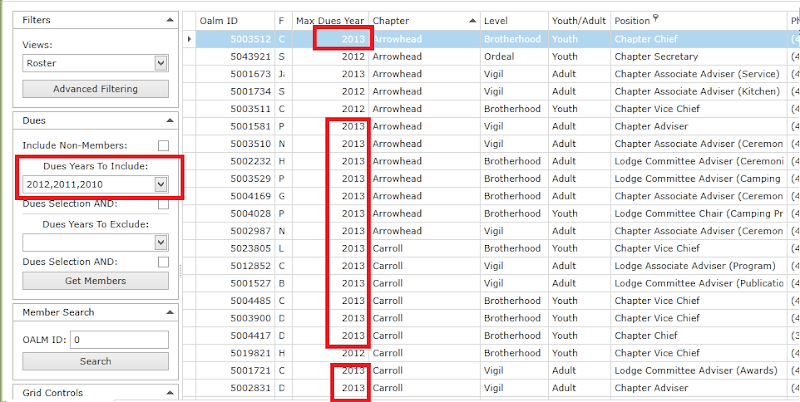 In the updated version of the Order of the Arrow "LodgeMaster" membership database, there are new ways of looking for information. One we struggled with in prior versions was checking on dues paid status for individuals, whether in a unit, or in a Lodge position. Below are the results of a query where I altered the "dues years to include" to cover the range 2010 through 2012. Not shown is the advanced filtering condition where position is not empty. You'll notice there are dues paid records for 2013, though one might expect these to be outside the range specified. The reason these appear is that these members also paid in a prior year, so they match the rules given. To view only those records in the range requested, you will need to add an "exclude" year condition so that the current year does not match. The following views of OA LodgeMaster 3 should be close to the version others will see once the release happens and our database is upgraded. These screens are from the web version, which can and probably should be used for future election entry. I'll show how to limit the view to one unit, as someone would when entering election results from one unit. The date for the Youth should be set. Figure 1 - a basic roster view, with all dues year, as well as "non-Ordeal" added. 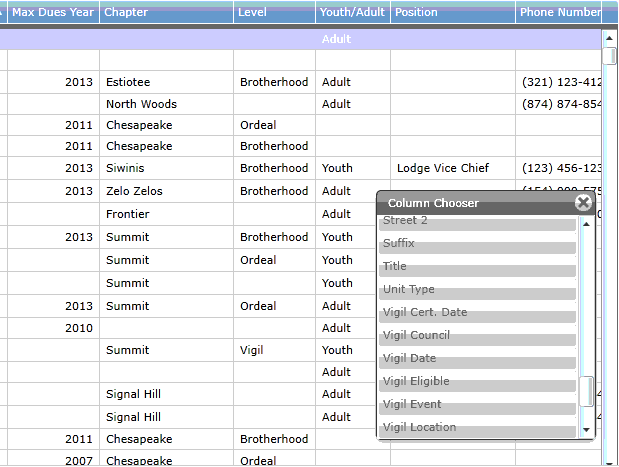 figure 2 displays the "column chooser" - I added unit number, election date, etc. figure 4 is the same unit, with Ordeal and other honors removed. 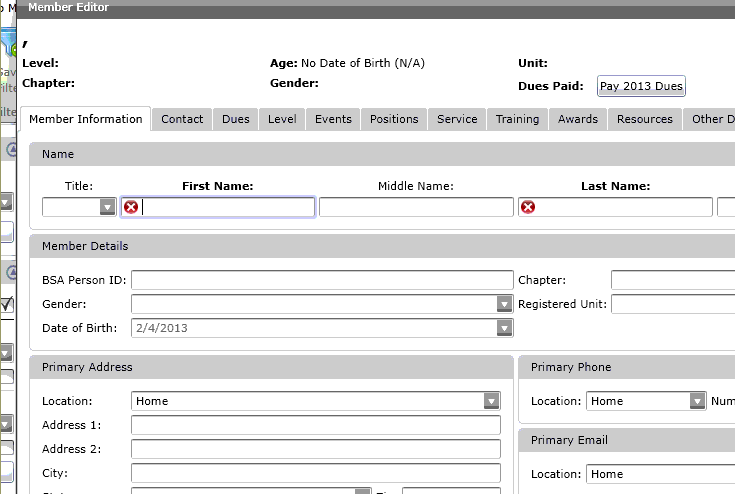 figure 5 - clicking on "Add" member gives a basic personal data entry screen, as in the desktop version for 2.x. Only first and last names are mandatory, but many more would normally be needed for each Candidate. figure 6 - one fictitious member mostly created. The OALM ID is still 0, and the Contact tab has been glossed over. 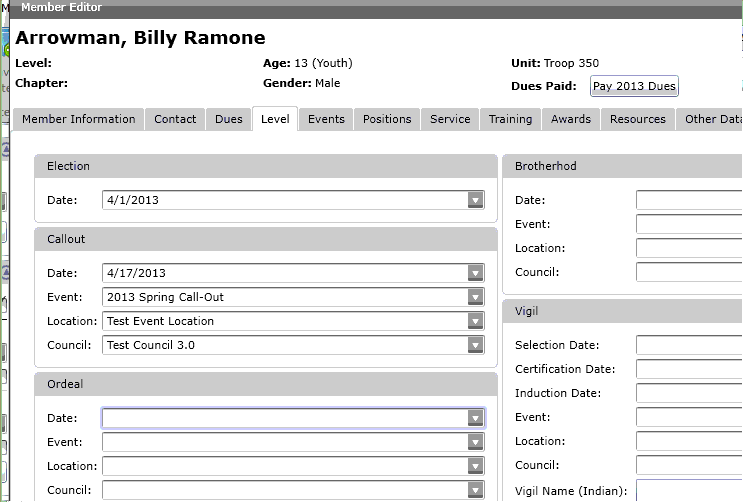 I added Callout information, which may or may not be ready, if ever, for any who are elected. 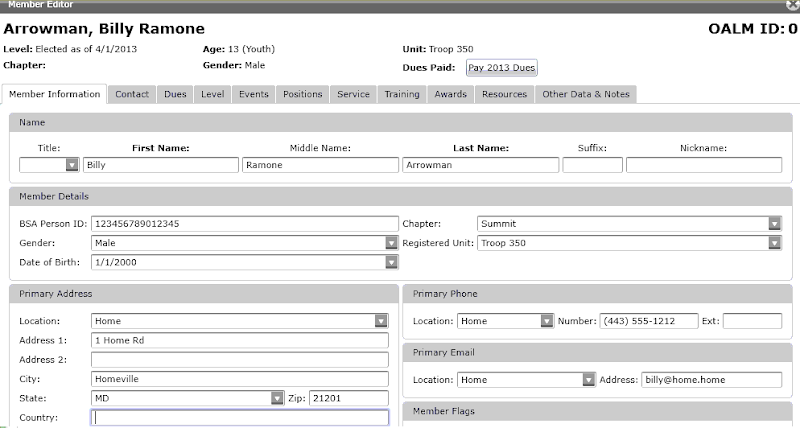 figure 7 - a more filled-out member information tab. 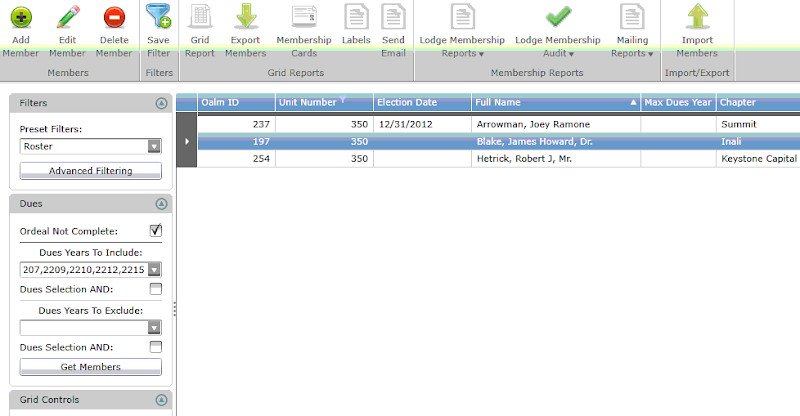 figure 8 is back to the primary (multiple) membership record list, with one additional election record than previously. If several were elected, they would be added after this, one by one. The web version saves regularly, so there should be no "synchronization" required.